Is DIY Heating Repair Dangerous? It’s the middle of a Brooklyn winter, and your heating system is on the fritz. If you’re a dedicated do-it-yourselfer, or if money is tight, it can be tempting to try to fix it yourself. But, while it’s great to know how your furnace works and perform maintenance and simple fixes yourself, a heating system can be dangerous if repaired incorrectly. At Petri Plumbing & Heating, we encourage our Brooklyn neighbors to be knowledgeable about their heating systems and take care of simple tasks themselves, but we also want them to be safe and healthy. Changing filters, lighting pilot lights, changing thermostat batteries – all of these are jobs you can tackle on your own. But for bigger problems, it’s safer to call an experienced professional for heating repair. Here are a few of the dangers of DIY heater repair. If your system runs on natural gas or another fossil fuel, it produces carbon monoxide, an odorless, colorless gas that, if allowed to build up in your home, can cause serious health problems or even death. Your furnace is designed to keep carbon monoxide out of your home. Improper repairs can damage the ventilation system and let carbon monoxide leak into living spaces. If you suspect a carbon monoxide leak, leave your house immediately and call an experienced professional. If your heating system runs on natural gas, you should not try to repair it yourself. Natural gas is a safe, efficient fuel when used correctly, but it is also highly flammable. If allowed to leak into your home, it can ignite and cause an explosion. An experienced HVAC professional knows how to keep gas lines safe and leak-free. If you smell the telltale rotten eggs odor of natural gas, evacuate your home immediately and call 911 from a safe distance. Then, call the service experts at Petri for repair. 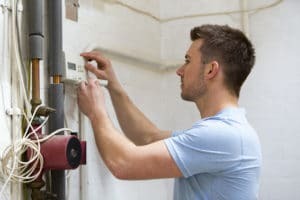 Heating systems rely on high-voltage electricity to function, and if you try to repair them without proper tools, safety gear and know-how, you risk damaging the unit or even electrocuting yourself. Play it safe and call a professional before working with the electrical components of your unit. It’s not just a risk to life and limb, but DIY heating system repairs are a risk to your wallet. If your system is under warranty, you could void the warranty by working on it yourself, meaning you’ll have to pay full price for future repairs. Keep your warranty intact, and don’t attempt risky repairs on your own. Petri Plumbing & Heating is right around the corner and ready to help you diagnose and repair your Brooklyn heating system. We’ll even give you tips about which projects are safe for DIY. Contact us today at (718) 748-1254 to get your heating system up and running again.